The Transkei contains some truly beautiful scenery in its interior but is best known for the Wild Coast, where most of the popular travel destinations can be found. Highlights include Coffee Bay, a quaint little community close to the natural wonder of the Hole in the Wall, and Mdumbi, a camping and backpacking haven on the hill above a beautiful bay. 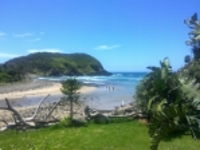 Port St Johns is a laid-back town generally considered the tourist hub of the shoreline while The Kraal Backpackers, near Mpande, is a self-sustaining and wildly popular backpacking community along a pristine stretch of coast. There is plenty of upmarket accommodation to be found along the Wild Coast. Inkwenkwezi Private Game Reserve is a good option for those wanting a touch of luxury on a holiday in the rural Eastern Cape. However, the region is most loved by budget travellers who enjoy backpackers and camping. The Wild Coast is a dream for outdoor adventurers in search of fun activities, with a wealth of kayaking, hiking, fishing, and surfing opportunities. There are also plenty of opportunites to trek to waterfalls and dramatic viewpoints. Many visitors to the Transkei also choose to take a tour of a traditional Xhosa community, where they can eat the local cuisine, chat to the people, and learn about their culture and lifestyle. Lodges and backpackers usually offer tours of this kind and some of them include the opportunity to spend the night in the community.